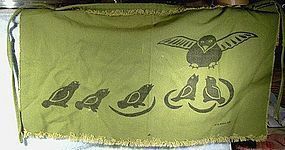 A vintage block printed fabric wall hanging by the Canadian Inuit artist Agnes Nanogak Goose (1925-2001). This highly regarded Holman artist was famous for her ink drawings and as a print maker, and she also produced block printed textiles, including cotton burlap. She was the first Inuit artist to receive and honorary degree from Mt. St. Vincent university. This wall hanging measures 24" x 14-3/4". The is not including the 52" tie cord - it is in the same colour fabric, perhaps the hanging had a wood rod originally, we don't know. It appears to be in excellent vintage condition with no stains, tears, losses, damage or repairs. All items are thoroughly and conservatively graded and all condition issues are noted; all items are vintage or antique and may have slight signs of gentle use. Small packet air shipping to the U.S. starts at $9.45 (other spots may vary). Items paid with a credit card will be shipped to confirmed addresses only. We do ship internationally. All of our prices are in $US. PLEASE NOTE: we DO NOT accept PayPal, only VISA and MASTERCARD. 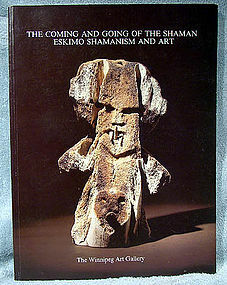 The Coming and Going of the Shaman Eskimo art book. This 246 page 12 x 9" soft cover book is entitled THE COMING AND GOING OF THE SHAMAN ESKIMO SHAMANISM AND ART and it was published by the Winnipeg Art Gallery for their Mar. 11 - June 11, 1978 exhibition. Profusely illustrated in black and white and colour, this book is in very good condition with foldback creases on the soft cover and some minor unobstructive surface abrasions on the cover from sliding against other books (very minor). This item is in excellent condition as described above. All items are thoroughly and conservatively graded and all condition issues are noted; all items are vintage or antique and may have slight signs of gentle use. Surface tracked shipping to the U.S. starts at $22 (other spots may vary, air is higher) - tracking and insurance are included in shipping quotes. Items paid with a credit card will be shipped to confirmed addresses only. We do ship internationally. All of our prices are in $US. PLEASE NOTE: we DO NOT accept PayPal, only VISA and MASTERCARD. 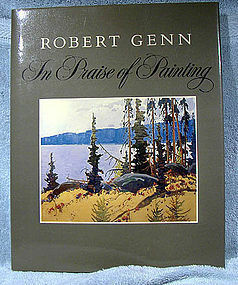 A copy of ROBERT GENN IN PRAISE OF PAINTING MERRITT 1981 a self-authored 133 page profusely illustrated art book, published in 1981 by Merritt Publishing of Vancouver, British Columbia. The illustrations are in colour and black and white, and this 12-1/2" x 9" book is in MINT unmarred condition. It also has the original dust jacket in superb condition as well, with only the slightest, barely noticeable edge bumps. A superb and essentially mint example of a scarce art book written by the artist. This item is in excellent condition as described above. All items are thoroughly and conservatively graded and all condition issues are noted; all items are vintage or antique and may have slight signs of gentle use. Shipping to the U.S. starts at $24 (other spots may vary, air is higher) - tracking and insurance are included in shipping quotes. Items paid with a credit card will be shipped to confirmed addresses only. We do ship internationally. All of our prices are in $US. PLEASE NOTE: we DO NOT accept PayPal, only VISA and MASTERCARD. History In Their Blood Indian Portraits - Grandmaison. 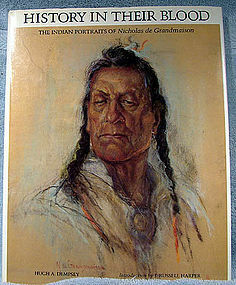 This splendid 124 page profusely illustrated art book is entitled HISTORY IN THEIR BLOOD THE INDIAN PORTRAITS OF NICHOLAS DE GRANDMAISON by Hugh A. Dempsey. Published in 1982 by Douglas & McIntyre, Vancouver, British Columbia, this 12-1/2 x 10" cloth-bound book is in excellent original condition with some light bending to the upper and lower edges of the spine; the original dust cover is present and it is in excellent condition with only some minor upper and lower edge bumping. This item is in excellent condition as noted above. All items are thoroughly and conservatively graded and all condition issues are noted; all items are vintage or antique and may have slight signs of gentle use. Surface tracked shipping to the U.S. starts at $23 (other spots may vary, air is higher) - tracking and insurance are included in shipping quotes. Items paid with a credit card will be shipped to confirmed addresses only. We do ship internationally. All of our prices are in $US. PLEASE NOTE: we DO NOT accept PayPal, only VISA and MASTERCARD. 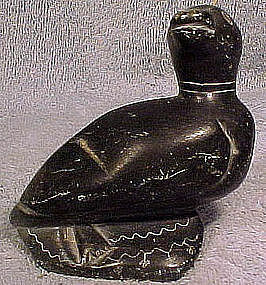 A 4" long carved soapstone Inuit figure of a basking seal. This carving has an artist's cypher plus the number E91684 on the bottom, and it is in excellent condition with no chips, cracks, losses, damage or repairs other than some minor surface abrasions. All items are thoroughly and conservatively graded and all condition issues are noted; all items are vintage or antique and may have slight signs of gentle use. Surface shipping to the U.S. starts at $12.50 (other spots may vary). Items paid with a credit card will be shipped to confirmed addresses only. We do ship internationally. All of our prices are in $US. PLEASE NOTE: we DO NOT accept PayPal. 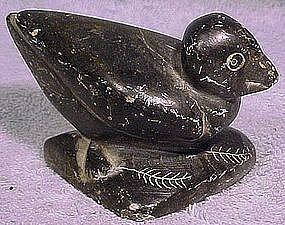 A 3-1/2" long and 3-7/8" high vintage Inuit stone carving of a bird. This carving is signed by Josie Pappy E-9-861 (JOSIE PAMIUTU PAPIALUK 1918-1996). This item is in excellent vintage condition with no cracks, chips, losses, damage or repairs - some scrapes, which occur with this type of stone. All items are thoroughly and conservatively graded and all condition issues are noted; all items are secondhand and may have slight signs of gentle use. Tracked packet air post to the U.S. starts at $18 (other spots may vary). Items paid with a credit card will be shipped to confirmed addresses only. We do ship internationally. All of our prices are in $US. PLEASE NOTE: we do not accept PayPal. 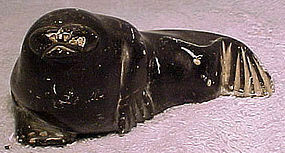 A 4-7/8" long and 2-1/4" high vintage Inuit Eskimo sopastone carving of a walrus c1950-60. 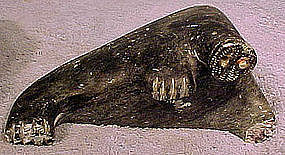 This unsigned (or at least no signature still visible)carving is in fair original condition with no cracks, damage or repairs other than the loss of the two tusks, some chipping to the feet and some minor scrapes. All items are thoroughly and conservatively graded and all condition issues are noted; all items are secondhand and may have slight signs of gentle use. Surface shipping to the continental U.S. starts at $16 (other spots may vary). Items paid with a credit card will be shipped to confirmed addresses only. We do ship internationally. All of our prices are in $US. PLEASE NOTE: We DO NOT accept PayPal. 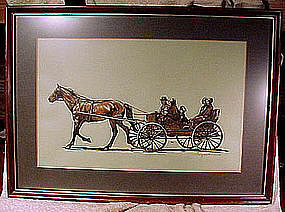 A well-done pen and ink drawing of a Mennonite family in their horse-drawn buggy. This 13-1/2" x 8-1/2" sight size drawing is in shades of brown with white, and it comes in a 17-3/4" x 12-3/4" gold trimmed wood frame. It is signed AUGUSTINE and it is glazed with non-glare glass. It is in excellent original condition with no chips, cracks, foxing, bends, tears, fading, losses, damage or repairs other than a few small scrapes to the finish on the frame and a small shallow crease to the paper. All items are thoroughly and conservatively graded and all condition issues are noted; all items are secondhand and may have slight signs of gentle use. Surface shipping to the U.S. starts at $28 (other spots may vary) - tracking is included. Items paid with a credit card will be shipped to confirmed addresses only. We do ship internationally. All of our prices are in $US. PLEASE NOTE: We DO NOT accept Paypal.